New Illinois Gov. 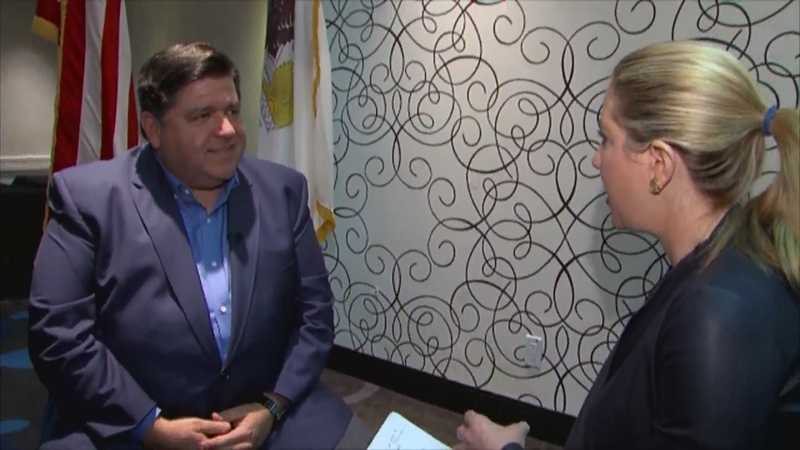 J.B. Pritzker sat down with Amanda Vinicky on Sunday, a day prior to taking the oath as the state’s 43rd chief executive. Here’s their full conversation, which has been edited for clarity. Amanda Vinicky: Best advice you’ve received and plan to follow as you become Illinois’ 43rd governor? J.B. Pritzker: Working on the budget from day one, from even before I got elected, was probably the best advice I got – to make sure you’re ready to present a balanced budget on February 20th, I believe is our date, and we will be. When I put together a budget team, which I think is second to none with Dan Hynes and David Harris and others, they’ve been involved in helping us put it together and my priorities will be evident in it. Vinicky: This is obviously a dream job for you, despite Illinois’ many challenges that will be tough to tackle. What did you want to be when you grew up? Pritzker: [Laughs] I had a very successful father who was an entrepreneur who started and built a business. He passed away when I was young, but I always wanted to emulate his entrepreneurship. So, it’s probably not surprising that part of my career was working with entrepreneurs and helping them become successful. Also, I had parents who were very involved in politics. My father was the Finance Chair for Ed Muskie, who ran for president in 1972. My mother and father both were very involved in progressive democratic politics – my mother especially – by marching for equal rights amendments and for LGBTQ rights. Vinicky: So politics was always part of that equation? Pritzker: Yeah, so think about that: entrepreneurship and politics, and that’s what I’ve done for a career. Vinicky: You will now be taking over the Governor’s Mansion and the Governor’s Office from Bruce Rauner. As you’re coming in, can you reflect on why think Illinois voters chose him four years ago? Vinicky: Despite not having held elected office, you’ve been involved with Illinois government so you think you have that understanding? Pritzker: I know that people think if you don’t hold public office, you can’t understand that. But I ran a state agency, I worked on Capitol Hill, I’ve been involved in helping people get elected and putting policies together, and I’ve been a national leader on early childhood education. To make progress on the issues you care about, you got to be willing to talk to people and, more importantly, listen to them in order to get something done. Otherwise, you can’t get big, important things done. I talked about this during the campaign: building 1871, advancing early childhood education, getting the Center on Wrongful Convictions supported – these are all things that require you to come together with lots of other people and compromise to finally get something big introduced and passed. Vinicky: And that state agency was the human rights commission? Vinicky: You are going to be coming in and doing something Illinois hasn’t seen much – if any – of, and that is supplementing your top staff income with money of your own. Did any of these individuals turn down positions with your admin at the state salary that was offered? Pritzker: In order to attract people to take the positions, it was important for me to offer salaries that were somewhat commensurate with what they might be willing to take. Most of the people are taking cuts in pay, even with the supplement that I’m offering to them. But look, this is about attracting and retaining great people in government, making sure that we’re able to do the things that were promised during the course of the campaign and lift up state government. You know, people look at state government and think this thing is in shambles. People who work in state government – their morale is very low. We need good leaders, we need to make sure we’re delivering for the taxpayers of Illinois and being very efficient in the process of doing that. It takes great people to do that. Pritzker: Well, I didn’t go forward and ask people until I thought we had an opportunity to offer them something that was more commensurate with what they might be willing to accept. Vinicky: How can you assure Illinois taxpayers that these individuals will be beholden to the state and not to you? Pritzker: First, we’ve been very transparent about this so that people understand that there’s no outside money, there isn’t some dark money effort or anything like that. Second, they are in fact committed to state government, they are making that statement when they agreed to do this. And third, you’ve seen the kinds of people that we’ve brought in. These are the kinds of people known to be public servants, right? These are folks who have served before, they’ve served admirably in public office, sometimes elected and sometimes appointed. Vinicky: There is an ethical question that arises, however. If they think you’re making a wrong, inappropriate, unethical, maybe even illegal decision – who knows – why would they perhaps risk losing half of their salary by saying no to you? Pritzker: Well, they are making the commitment to work for the state taxpayers. That’s what their commitment is here, and let’s be clear: any governor can fire anybody. Vinicky: At any point in time. Pritzker: [Nods]. We saw Governor Rauner fire virtually every one of his staff. I don’t think there’s any question that these folks will not make their views known. These are people that have demonstrated in their lives that they are ethical people already, and so I’m very pleased and proud to have these folks working for me. Vinicky: In negotiating a new contract with the largest public employee union, why should AFSCME members not expect a big pay raise if they’ve been given to these individuals? Pritzker: First, I’m fully committed to restarting the negotiations with AFSCME. I mean, [it] stalled for four years. Rauner was just unwilling to sit down with them. Second, they deserve a raise and have been granted a raise by virtue of the back pay that’s been granted to them by the courts, though not by Rauner. I’m going to sit down and negotiate a contract with AFSCME. I think that the state workers should be fully compensated for the work that they do. Vinicky: Are they not fully compensated now? Pritzker: Well, they haven’t been in fact. Governor Rauner’s been an obstacle to that. You can’t get to a contract if you’re not sitting at the table. And Governor Rauner just wanted to bust unions and hurt workers in the state, and the morale for many of them is so low because when you have a leader of the state who’s attacking you and you’re working for him, that brings down all functions of state government. We’re going to bring it back. Vinicky: Now, why not use tax credits as a way to implement a graduated income tax? That was something that came up the last time we had an interview. Pritzker: Well, I want to make sure we’re focused on getting a graduated income tax amendment passed for the constitution of the state. I think that’s the best way for us to get a fair tax system. Vinicky: And that will take some time, of course. So why not in the interim? Pritzker: Right. But there’s been a three-year project already to put a new one in, and it’s incomplete. We’ve got to go about that. Why is that important, just as one example, to bring efficiencies? Because I’ve seen in the private sector that when you can upgrade the systems and have a true enterprise resource planning system, you can bring down costs across departments. Vinicky: But that will still cost money. Pritzker: It will, but it’s money that’s been committed already. There are hundreds of millions of dollars that have been committed to this plan. That’s one thing we can do. But you have to have great people leading these agencies, who know how to bring efficiencies to them. Have a lift-up morale. That’s one of the reasons why I focused on attracting the best talent the state’s seen in a while in state government. Vinicky: So when can we see you introducing – when can we anticipate your introduction of a graduated income tax resolution? Vinicky: So no set timeline right now? Pritzker: There’s not a set timeline right now, but you know what the timeline is. It takes two years, essentially. So during the two years leading up to the 2020 November elections, we’ll be talking to the legislator about getting them to pass – supermajorities in both House and Senate. Then we need a supermajority of the voters to support it, too. I believe they do [support it]. I believe middle-class and working-class taxpayers need a break, too. I think most people will support a fair tax system partly because most states have a fair tax system and they’re doing much better than we are in terms of creating jobs and paying their pensions and balancing their budgets. Vinicky: We talked about supplementing some of your top staff income with some of your own funds. Is there any area where you’re going to commit to doing that in Illinois government? Vinicky: But no other areas where you’re going to commit private funding, say, to boost? Pritzker: I don’t have any plans for that. No.